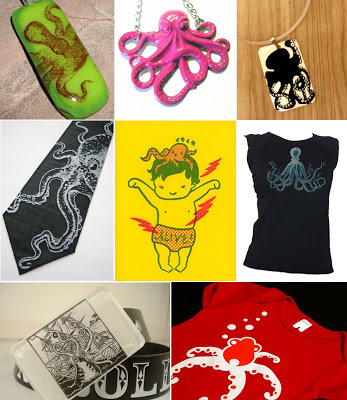 Oooh, these saucy cephalopods are popping up everywhere I look….even in my email! Whether mythical monster or delicious dish – here are few items for everyone’s taste. These are so great. I just did an octopus pattern too. I think they’re just fun to work with, hence the popularity. Thanks for the comment…I just checked out your work! Nice stuff…just love the bunny!